Insert a Boss lyric here. My wife and I were watching the Hess’s documentary on PBS 39 last night. Even though I wasn’t alive for Hess’s (and Allentown’s) mid-century glory, I visited the original store on 9th and Hamilton quite a few times in my youth (the 80s and early 90s). My memories of Hess’s aren’t as robust as my parents’: I never saw Pip’s show in the window, the Flower Show, or Adam West and Burt Ward. I do remember 1984 Olympic apparel and following the Swatch counter workers around the store because my cousins and I were convinced they had top-secret new designs on their persons (I remember them in white lab coats. please tell me this is not confabulation). I remember standing in line for a seat at the Patio (a formerly world-famous restaurant on the basement level for you out-of-towners) not very infrequently, and having my meal (usually chicken croquets) brought in a miniature oven and desserts (chocolate mousse) in tiny freezers. I remember the models, the French room, the spiraling drive of the parking deck. Other memories are more spotty. At some point, a store is a store is a store to a kid. How about the mirrored elevators that said “Thank you, your elevator will be here in a moment” when you pushed the button and announced what was on each floor as you arrived. Once a month “Clean Up” where women (and I’m sure a few men) would stand outside, waiting for the doors to open, then rushing to find the best bargains around, kind of like Black Friday shopping these days. The Bargain Basement. The crystal chandeliers. The fashion models (first place I ever saw a bikini!). The hot dogs at the Oasis with the New England cut rolls that were served on a paper just the right size. I could go on, but I’ll let someone else have some fun reminiscing. I have a friend who has one of the chandeliars that hung I think on the 4th floor……. I remember the parking deck, the Christmas decorations, and the sugar at The Patio. At one time, the entrance from the parking deck came into the toy department, and you just had to visit during Christmas to see all the animated toys. (That was a big thing back in those days!) My mother and I could go to Allentown to shop for a Saturday and never leave Hess’s until it closed at 5:30. Of course, that included a trip to the Patio. (We learned that if we got in line as soon as we got to the store, we would be at the front and be one of the first ones to be seated when it opened at 11!) My mother had friends who would share a grilled cheese sandwich at a diner so they could each have a whole dessert at the Patio! I remember the talking elevators, for sure. And the sugar. Judy, I love that your mom and her friend split a grilled cheese to save room for dessert. Strawberry Pie? I think there was also some kind of jewelry counter that abutted the line for the Patio, right? Always went at my birthday in November. Had lunch with the girls in the family at the Patio. Had chicken livers on toast for the first time and saved room for that amazing strawberry pie. It was hugh!!! You could purchase a pie in the 10″ pan and take it home. What a treat!! In 1974, and other years as well, Hess’s photo studio was the official Parkland High School senior picture photographer. That was in the the day when all boys had to wear coat and tie, and all the girls had to wear the same blouse…yes, you went to the studio and they gave you the chosen white blouse in your size. In your personal pictures, they would “colorize” the blouse for you., but the official yearbook pic blouse was white. I liked the Oasis Snack Bar, located on the first floor near the greeting card section. Had my first Taylor Pork Roll sandwich, with mustard and pickle, at that snack bar. I sat with Santa as a little girl, and planned my honeymoon through Hess’s Travel. Long before the parking deck, there were just “Park and Shop” parking lots or street parking, and my mom could really parallel park! I remember buying Christmas presents there before it closed. I think I bought a small silver chain for a girlfriend one Christmas… maybe 1994? It didn’t get delivered b/c we tragically broke up 1 week before Christmas. HA! I remember the patio. The Strawberry Pie was the greatest. A couple years ago I saw the signs from the elevators re-used as a coffee table by a creative artist who salvaged the signs a other things before their removal. Worth noting, the owners of the Cosmopolitan across the street from Symphony Hall restored four of the chandeliers and hung them in the new restaurant. Exquisit. I also remember the political battles of the 1990’s when political leaders argued over building a hockey arena or a convention center at 9th and Hamilton. Hess’ came down, but those battles continue on other tracks of land. I enjoy the afternoons when the small growers market opens during the summer and fall months and the periodic community events that pop up at that location. It’s almost a recognition that people can continue to gather amidst the history. I’m probably the youngest of people that remember Hess’, but I also know life at 9th and Hamilton as a resident living 2 blocks away and as somebody who enjoys Blues Brews and BBQs. I like the idea that people in Allentown sort of instinctively gather at 9th and Hamilton for community events…the market Geoff mentions is one. The tree lighting. Kids running through the fountains when it’s hot. Sort of broadens the idea of sacred space and shared space. It’s pretty amazing that a city the size of Allentown supported Hess’s, Leh’s, Zolinger’s and others. That’s a lot of consumer dollars to spread around. The documentary last night said that Valley residents spent an average of .39 of every consumer dollar at Hess’s in its heyday. Amazing. That says something about loyalty and about the way people in our community support good enterprises. There are plenty of memories involving Hess’ department store(s) for The Pritchard Family. Bernard, Glenn’s father, told stories of during Christmas time in the 1950’s when Hamilton St., near the store, had Christmas trees adorned with holiday decorations on top of the street lights. Arlene, Glenn’s mother, remebered shopping there during the week for items on sale, seeing Max Hess, the store’s founder strolling through and, the large chandelier in the main entrance. Glenn remembers the men’s colonge section which had a large selection of current fragences. Also, Glenn remembers the many satellite stores, especially Whitehall’s and the one in Trexlertown, and purchasing Men’s pants when Hess’ had the merchandise on sale. I had a cousin who worked at Hess’s in the 60’s and maybe 70’s. All of the women who worked there had to wear black dresses. Also, there was a man who my grandmother would say was the “floor walker” who always wore a corsage in his lapel. He didn’t look much like the security guards of today, but I guess he didn’t have to. I also remember Wee Willie Webber who would MC the Christmas TV show of all of the animated toys that Hess’s would sell, although I am not sure if anybody ever bought them…the clown who did flips on the high bar, the dog that did tricks. Oh how I miss Hess’s! how about the perfume spray that filled the air as you walked in the doors …. All, these are great! Thanks so much and keep them coming! I was a floor walker at BestBuy in the late 90s on occasion. Not quite the same. I actually never knew that Max Hess, Jr. was the one who sold the land up there that the Lehigh Valley Mall was to be built on. Speaking of the malls, the youngest people that can remember Hess’s (people my age) are probably the only ones who also get nostalgic for the Whitehall Mall. Christmas on Hamilton Street was just fabulous. Hess’s, “Pip the Mouse” was one of my favorite Christmas memories. The store was always decorated beautifully during the Holiday Season. Blue Hyacinth perfume was one of the wonderful sprays that met you upon entering the store on the Hamilton St. side. I bought it for my mother, who just loved it. I remember once when I was 8 months pregnant with my second child, I attended one of the Bargain Basement specials. I ran up 5 flights of stairs to get a beautiful Oriental Rug on sale. That was such a buy! It was the middle of winter and it was cold waiting outside till the doors opened, but it was worth it. Hess’s was a great store! My father, (Pete Branca was his stage name) played in orchestras all of his life. He passed in “76”, but when Max Hess would have parties, he would get my dad and his band. He told us some wonderful stories of the many stars that he met at Max’s house on Livingston St. and of the friendly manner in which Max conducted himself. Those were the good ole’ days. Hi Gerri! Thanks for sharing those great memories! I’ve always wish I could have really seen Hess’s at its peak. I had the pleasure of going to the Hess Mansion a few years ago, and recent owners seem to have kept the basement nightclub much like it was when Max had those parties. There are framed pictures of all the celebs on the walls. What a great experience it must been to play there! That Strawberry Pie from the restaurant, was to die for. On occasion, when I was in high school, I would purchase one as a treat for my family. The pie was so delicious and the crust was really, really tasty. No other restaurant in the area could compare to the quality of “Hess’s Patio”. It was a magical place when I think about it. Kicking off the Christmas Season with the Hess’s Holiday Toy Show on TV was of course a big hit. I wish someone would bring back Hess’s Patio Restaurant in some form…think it would be a hit. I can still see the layout of the store from shoes to the Bargain Basement. You just can duplicate a store like this. I thought the Patio workers wore dresses like the Hess’s bags, that I remember. I used to wonder if their dresses would rip like a bag! The chandeliers were gorgeous too. I remember the line was always long to dine at the Patio but if you had someone that could save your place you could shop the surrounding bargains too. It was just a store that you have to experience to explain and I feel nothing like this at any of the mall stores. I remember going there with my brother and later on in life taking my children there. Walking in from the parking deck down the hallway filled with lights and I think I remember a small store to the left when you would walk in. Eating at the Patio restaurant was always a treat. The coconut cream pie was the greatest! Also my children remember getting their food in small metal refrigerators and stoves. Standing in line and looking at the pies and other desserts in the case and the sugar and other things that were for sale on the right hand side. We also enjoyed looking at the models as they walked around while we would be eating. We would shop in the bargain basement and my sister would always find Thomas The Tank clothes for her son. There are so many other things to mention. I really,really miss those times! I always loved the spiral exit ramp. It’s bittersweet finding Hess’s bags and boxes at local antique stores and relatives’ houses. Here’s bittersweet: If you drive to the South Mall, in Allentown, and drive around to the back of the mall, where deliveries are made, there is a small trailer that has taken up permanent residence in the back of the lot. Perhaps it is for storage. It’s definitely not road worthy anymore. Anyway, look at the logo on the back door. It was a Hess’ trailer. That is an awesome find. I’m going to go get a picture of it. By the way, local readers, I’m going to do a post soon about the history of regional sports, probably focusing on some 1960s Allentown youth league football and 1970s/80s men’s fastpitch softball. Stay tuned! My dad managed the diner across the street from Hess’s,next to the Boyd Theater (it was moved to 9th and Linden to make space for the PP&L annex in the late 60’s or early seventies). The thing I remember the most was their annual Flower Show where the show was filled with huge displays of exotic orchids and other blooms.Tourists came by the busloads to see them. I am looking into one of the suppliers of those exotic orchids. I’m not having much luck but was told that a Dr. Bachman from Emmaus was one of them. I would have loved to see this store in it’s glory days. by the way, if anyone has any vintage Hess’s pictures or other pictures from days gone by in the city, please do feel free to scan them and send them to me. I’d love to put them up on the blog! Not computer savvy here. I have a pic on my cellphone of the back door of the Hess’ trailer in the South Mall parking lot. I tried to find a email address to send it directly to, but all I found were online forms for submissions. A little help here? thanks!!!! Can’t wait to see it! got it. Thanks!!!! I’ll be posting it soon. I don’t know why I didn’t think of that sooner! Time to fire up the scanner! My wife brought up a good question: Hess’ had revolving doors along Hamilton Blvd in Allentown. As a kid, it seemed like the doors would just whisk you right in (or out) without having to actually touch them. In later years, you had to push them. Did they ever actually spin on their own, or did it just seem like that from a little kid’s perspective? Good question! I’ll have to ask my Mom and Dad! Related: How about those boats at Dorney Park in the pond between The Zephyr and Journey to the Center of the Earth? Even though you could see the tracks from the SkyRide, you were never totally sure that you didn’t have to steer the boats. I miss that stuff! Frank’s mom checking in here. I think I was the force that allowed Frank to spin right into Hess’s. After all, he was a little kid and at 5’5″ I towered over him and got rid of all obstacles that threatened him. Funny that he didn’t even know it!! Moms are the best. Even when we don’t realize it. Im 47 and I miss Hess’s…..Loved the 4th floor toy department and oooh and ahhhed at the beautiful barbies and stuff I knew I wasnt getting..lol and the bargain basement wow…..I spent hrs down there…I never had the oppourtunity to try their world famous strawberry pie, but wish I had…..I was more the McCrorys bannana split kinda gal..where ya popped a balloon to see how much it would be. I really miss Allentown the way it was… Even Lehs was a hide out for me….I really miss all 3 places but Hess’s hlds the most memories for me. My Grandfather Lawrence Luckenbach worked for Max Hess for many many years. In fact he lived on Livingston street several blocks away. I remember many stories of hess’s that were passed down from my mom. It’s such a shame that today there aren’t wonderful places like that anymore. Lilli A. Thanks for reading and sharing your memories, Lilli! Great site! I LOVED the Hess’s experience and sometimes wonder if it really happened! The Patio was especially surreal: gigantic menus, huge portions, the desserts! I remember there was a drink menu that was pretty dated, featuring “grasshoppers” and such. I was too young to drink, though, and Mom refrained. When I was a little kid, I’d get a cheeseburger served on the stove and I’d split chocolate cream pie with my sister. Later, I’d have a giganic shrimp cocktail, french fries, and dessert. There were always leftovers. I loved the models overly made up faces and 80’s dresses with gigantic shoulder pads and sequins (love the French Room, too! So much fun for young girls!) Why isn’t there a Patio Desserts Cookbook out there? Who were the pastry chefs? Who were the models? WHat were their stories? Who designed teh menus? The restaurant decor was pretty amazing, too- green and tourquoise is my recollection. If I could open a restaurant myself, I would follow the Patio’s lead, such great memories..
Caroline! Great comments and memories. I used to get honey-dipped (or, if you prefer, “dipt”) chicken in the the little oven and always chocolate muse for dessert. I’d love to find out more about the chefs, designers, models, and the people that made the Patio so unique. Ah, the French Room. I have a neighbor who was a hess’s model. She now has to be 70 yrs old but still looks really good. Those were the days and I wish they were here again! I grew up in Allentown and Hess’s was a big part of that…there could never be another. Two bits of info I can give. 1) The revolving doors were never powered…they just had so many people going in and out that they almost never stopped spinning. 2) The amazing portions of the ‘Patio’ are because they used it as a ‘loss leader’ and, in all the years it existed, it lost money every year. Those are great comments and I love the image of the revolving doors constantly moving because of foot traffic. Thank you, Clyde! I remember the store at its best before Max Hess died and the branches were opened. His personal touch was palpable. I remember a headles and winged statue in the middle of the shoe dept. in the 60’s. I am surmising it was a museum piece from Italy. It just barely cleared the ceiling. And mirrors everywhere ! I was walking down the stairs ti the basement and became momentarily disoriented because the stairs turned twice and all the walls were lined with mirrors !. Does anyone know the recipe for the Patio’s Chicken ala King? It was the best. I think the puff pastry is what made it. I have the Strawberry pie, but would really like that recipe as well. No, I don’t have the recipe for Hess’s Chicken ala King, I wish I had it, but I do remember my parents taking me to Hess’s Patio when I was just a little girl back in the late 40’s. I remember that burst of flavor in my mouth even at that young age I knew I was eating something heavenly. I have never found anything to compare it with. It was so yummy. you are right Kristen the puff pastry was so good. Did Hess’s ever have a little coaster ride? Not in my memory, but maybe! They had everything else! 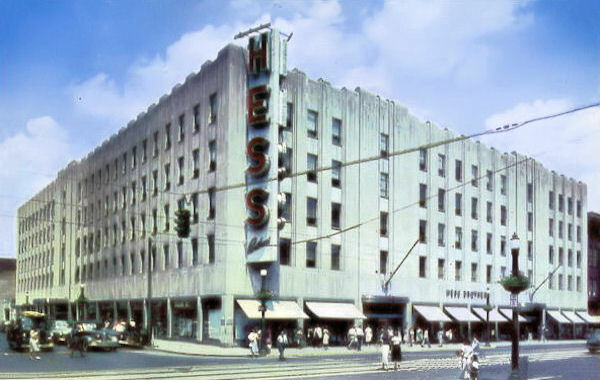 I grew up going to Hess Department store even though we were from Luzerne County. My fondest memories are with that store. I spent a lot of visits there. My christening outfit was purchased there. Even though I am now in my 40’s; every memory recalls vividly. To a young girl it was magical. My heart breaks that it closed. I was forced to shut a part of my life that gave me so much joy. I recall the stairwells with each floor that came out on each floor. Each stairwell entrance was different at each floor. One of my fondest memories is the “talking elevator”. I can still here it saying, “Thank you, your elevator will be here in a moment”. i have such wonderful memories of that store. My sister-in-law and I would shop down town and we would make a full day of it with our children who were small at that time. We would always have lunch at the Patio. Does anyone remember the back door that you could go through to escape the line. When we would go through this back door, we would get a table immediately. It probably was not a nice thing to do, but at the time with our children, it was a God send. We would call and have a reservation time and voila, there we were and the kiddies loved it there. We would do each and every floor and come home really tired and usually with some good sale items. There will never be another store like it. There was a secret door to the Patio? How did my grandparents miss that? I remember the different floors, but I remember my mom taking my sister and I there for special lunches. I also just wanted to see. is there a recipe book or somewhere to find Hess’s patio specialties? I found the recipe for the famous Strawberry pie but my sis in law is looking for a cheesecake recipe that apparently Hess’s had that she remembers as a kid. (i don’t eat cheesecake but said I’d help look). I remember the Christmas toy soldiers that stood guard at the doors. I think I’ve seen a few around other places. yep, two of the Toy Soldiers are now part of the Liberty Bell Museum at Zion’s Reformed UCC on Hamilton. They’re on display outside every year during Christmastide. not sure about the cheesecake recipe, but my Dad and I were just talking yesterday about how amazing the Patio was. Thanks for the comment! Have to add to this…Lived in Allentown back in the 60’s and 70’s…it is most certainly not the same! I remember the newest additions to the 4th floor electronics dept…HP hand held calculators that went for over $900! Lobster egg rolls at the Patio…4th floor…housewares, appliances, toys (the elevator!). How about the totally mirrored stairways against the walls that most people didn’t use? The wonderful Hess Bros. sign that cycled through many different colors? I missed this comment earlier. Great share! Thanks! Yes, it was a wonderful place to grow up with…Still looking for that Lobster Egg Roll recipe, though! Well better late than never. I’ve been trying to find info on the Christmas Toy shows on tv but hadn’t had much luck. This stuff is great–I just read thru the replies. My grandmother lived in Allentown and we’d visit her often (from Reading). My sister and I went to Hess’ a lot–especially when we were old enough to go by ourselves. (That was back in the 70’s; in the 60s we went with our mom.) I loved that store. I used to wait with big expectations for the toy show to come on television at Christmas. It amazed me back in the 60s. The prices amazed me, too, and my sister and I would often wonder who would buy these things. I remember the magician toy (his face), and the monkeys. Oh I would love to see those re-run sometime. Even the fashion shows were on tv now and then. Christopher, you referred to Dorney Park. That was another integral part of my growing up. My parents took us there every summer since I was probably 8 or so. (I’m now 55…) My first ride on the Comet and I knocked my face on the bar in front of me and knocked out a tooth. That’s when it first went down thru a tunnel before going up the big hill. It’s still one of my favorite coasters. The bumper cars (original ones); the paratrooper; the sky ride; Journey to the Center of the Earth. Wow–we just waited for that night at Dorney every summer. We still do it… Thanks for the memories! anybody remember the treehoue you could play in in the childrens clothing department? that does sound familiar but may have been before my time. Great share! My grandmother loved taking us to the Patio – it was like a “posh” outing for us. I remember getting my Guess jeans there, and oh, that Swatch counter! As a teen, I would treat myself to a Godiva chocolate, just one, every time I went there. I once did a school report on Hess’s and only remembered it when you mentioned Max Hess Jr. I can picture the shoe section like I was there yesterday. The parking deck was my favorite – I used to work at going a little faster down the spiral each time and never scratched. When I was in college and would bring friends home to visit, I would take them up to the top of the parking deck to see the view. I do kind of think nostalgically of the Whitehall Mall! Yes!!!!! I remember the Guess Jean section…red label and green label if I’m not mistaken. I love that you took folks up to the deck to see the view. Great share, Amy! I worked in this store during summers and Christmas breaks all through college. I remember actually being scared as customers ran through the store for clearances. We could only wear solid black, brown, or navy dresses. Remember my friends and I would play hide and seek in the store, it was so huge! At least it seemed that way to a ten year old. My mom and I would eat lunch there after I was married with a baby. We always took home those huge creme puffs. We loved them. I took my kids in the late 80’s, early 90’s. Went shopping with my friends in the mid 70’s. I loved going there. It was a big deal to drive to Allentown from Bangor. The Oasis Cafe was a favorite place to grab a few treats to take home as an adult. Swatch…I still have the watches I bought my boys at that counter. As a nurse at St. Luke’s, I remember in the early 80’s, getting strawberry pies from patient families for all the staff to share…that was a great treat on a busy evening! I loved browsing thru that store. And, I have great fond memories of Whitehall Mall in the 70’s..Orange Julius was a staple every time we teenagers made the trek from Bangor. I really miss those days!